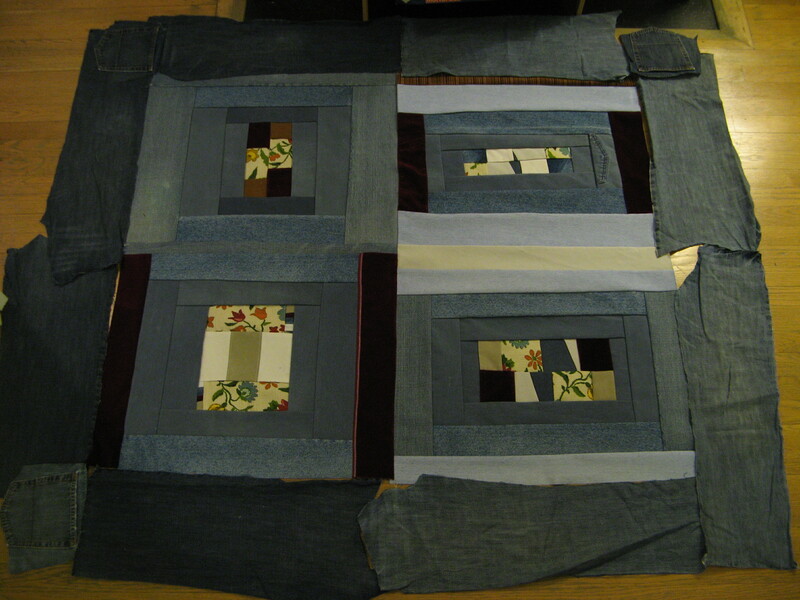 There sat a bag filled with old pants: a contribution from my mother to the quilt-old-clothes enterprise. The day to figure out whether I could do something with these old pants had arrived. 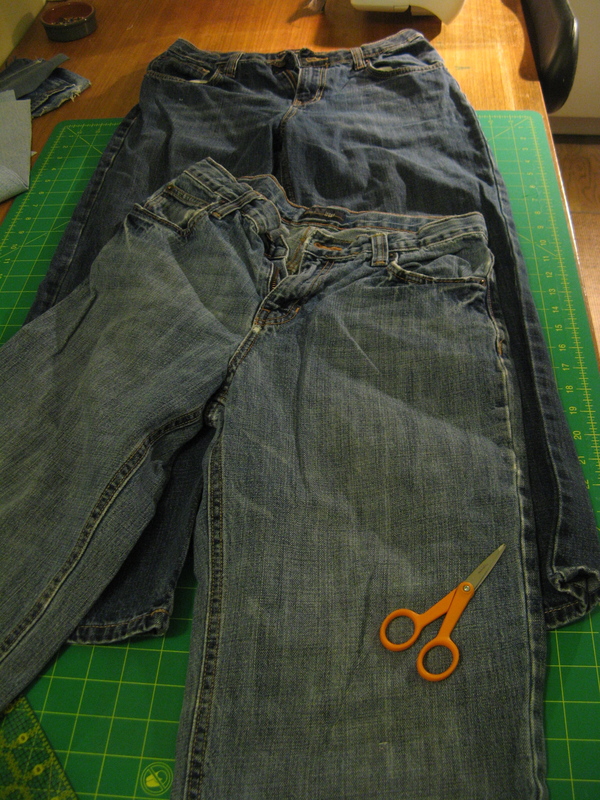 Three pairs of denim, seven khakis and a whole lot of cutting. The first order of business is always “stripping the carcass,” and for this a rotary cutter ﻿is a marvel. Cutting is time to ponder the fabric. 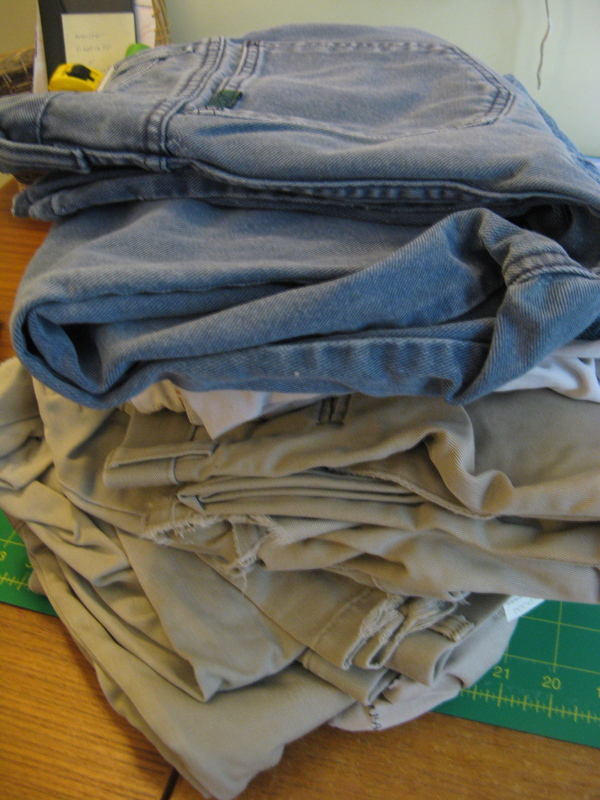 I feel the khakis don’t merit the prime real estate quiltop – but will serve suitably for backing. 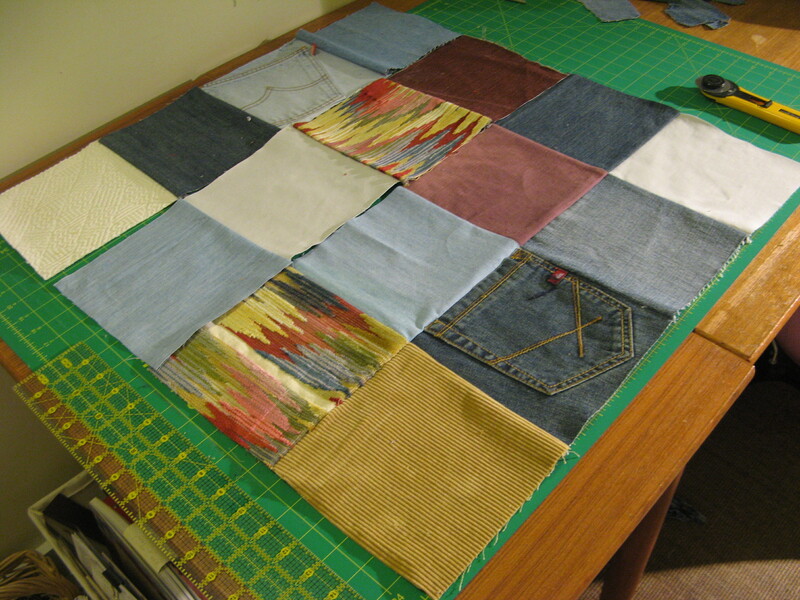 The denims are wonderfully weighty and possess a range of hues, but bright color is needed. My heavyweight stash offers highlight color from My First Commission remnants, as does a deep garnet velvet my mother gave me recently. Starting somewhere with red velvet, floral MFC curtain and a rust-denim. 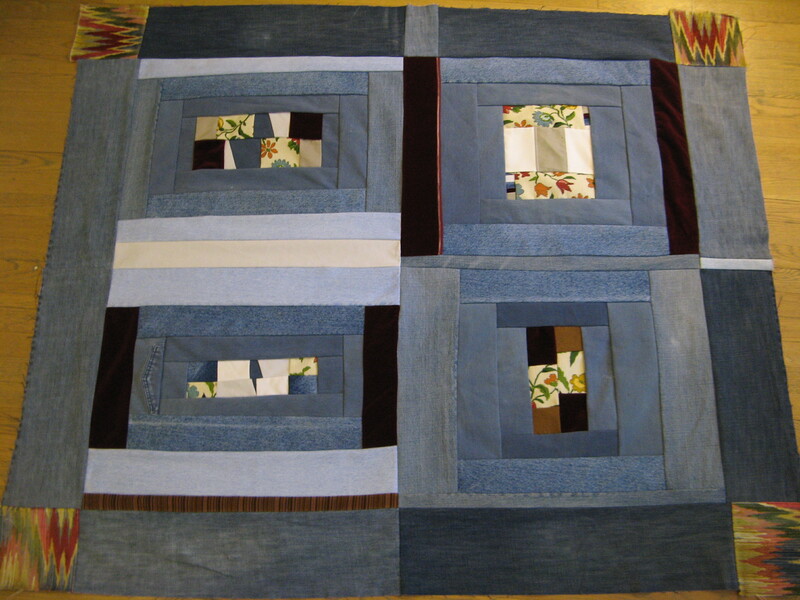 What emerges is a style quilters who got here before me call Housetop. Bright color anchors the middle, supporting strips build the sides. The fun of it is it gets big quickly because of all those jeans legs. 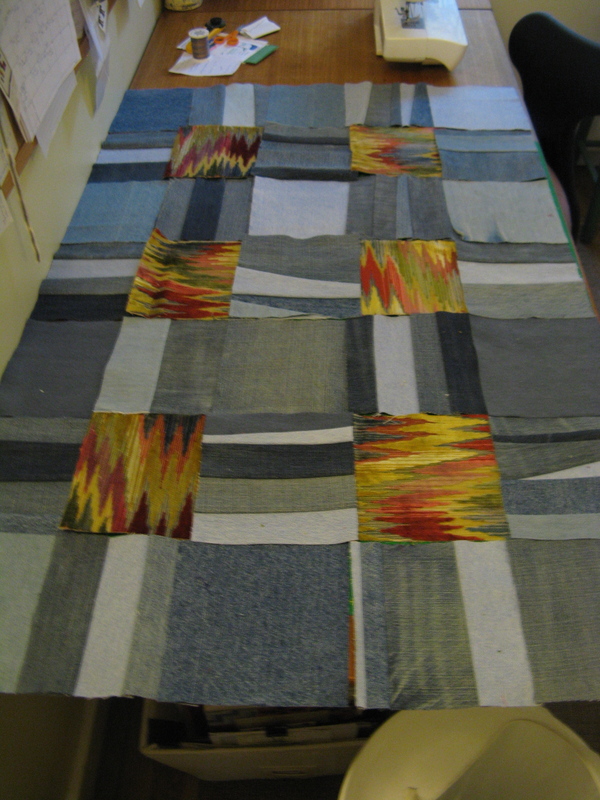 Front legs feature worn areas around the knees, as in some of the Gee’s Bend quilts which continue to be a divine inspiration me. Still, the color isn't popping here the way it is in the Gee's Bend quilts (seriously, you won't regret opening the link above). Now he prefers "skinny jeans" anyway. Does that mean he's a hipster? There's a substantial, "rugged" feel to this piece: I can almost smell the wood smoke. but the corners could do with a little brightening. There is a mystery fabric I think might help. When my mother-in-law contributed her remnants for MFC, there was nearly a yard of upholstery which looks “retro” enough to be mid-century. Unfortunately there was nothing printed on the selvage line to identify it. Would you use this for curtains? Shazam! 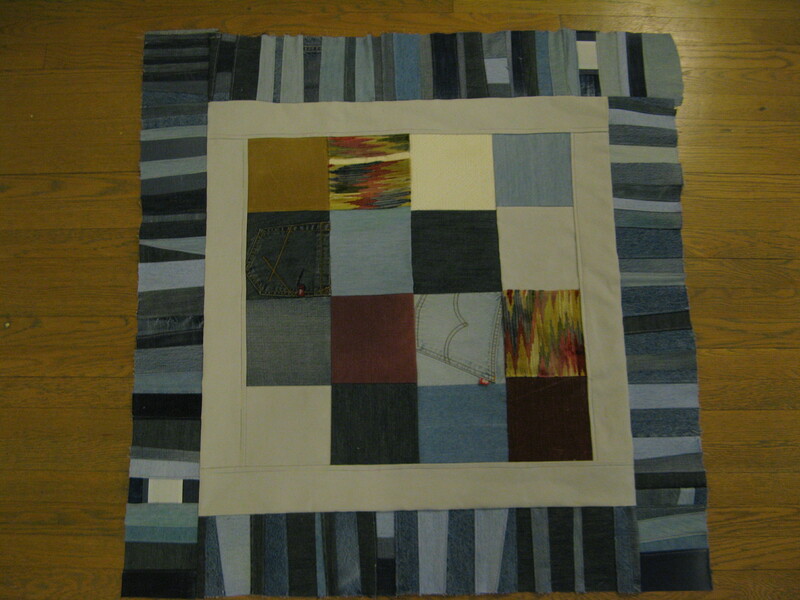 With border added, the first quilt upcycled from these old pants measures 56 x 65 inches, a generous throw. It will be finished when fill and a khaki back are added. Many small pieces of denim remain. 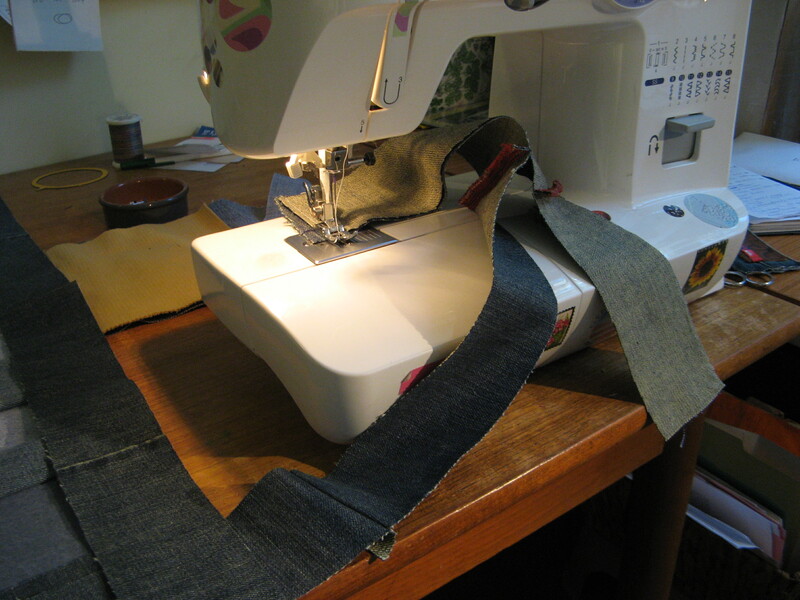 With Modest Machine still armed with a heavyweight needle, I decide to keep going and use up the denim scraps. The mystery fabric leads the way. I like how its zig-zag pattern echoes with random denim strips. Perhaps a throw for a dog bed? This just needed to be sewed up — I didn’t want to embellish it any more than it appears above. With a narrow denim strip border, it's a big welcome mat size. 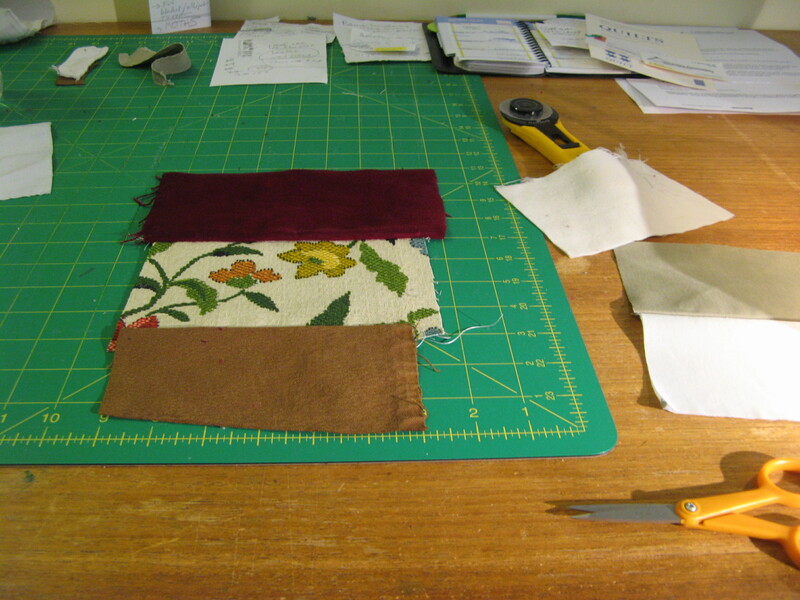 I like to leave pockets or plackets or other hints of the prior life of fabric when possible. This is quick, so I feel productive. 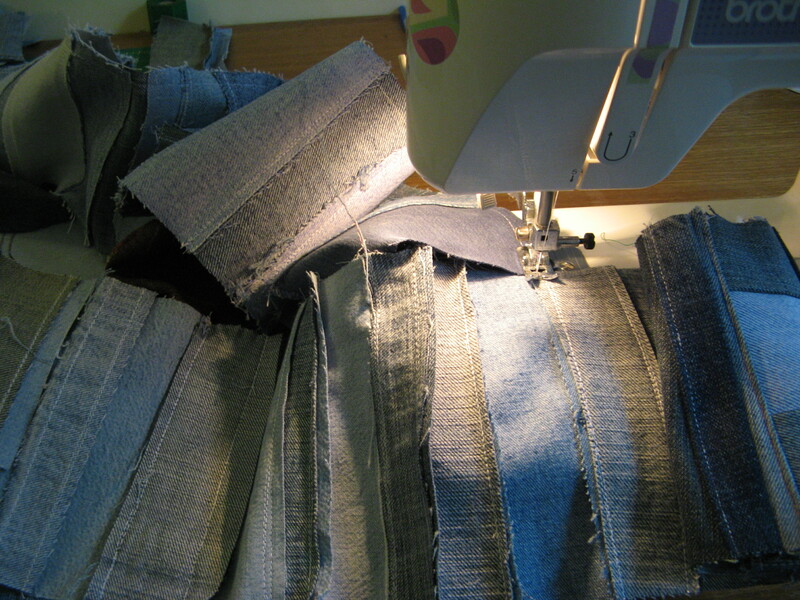 Then all the seams need pressing, so I take two steps back. A khaki border “mat” gives the feeling a of picture frame. 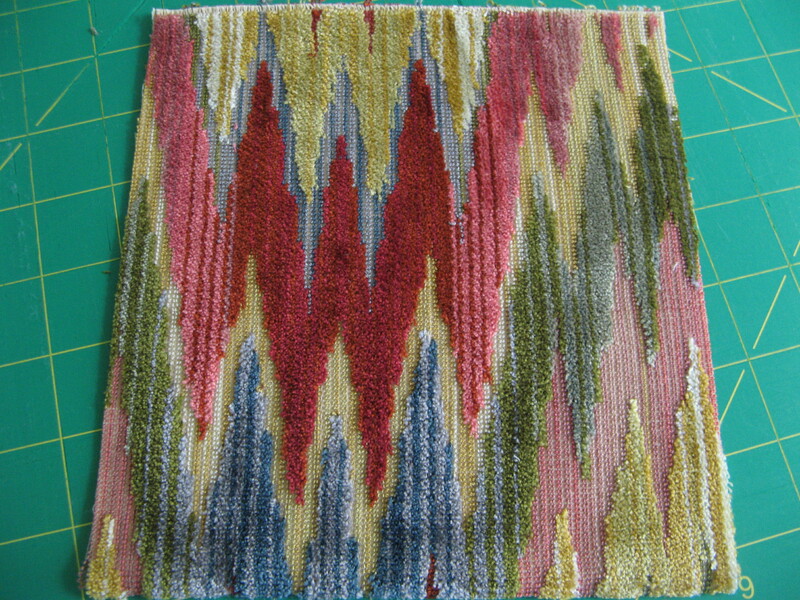 Perhaps a wall hanging? This didn't use much khaki, but it still needs a back so the khaki won't go to waste. 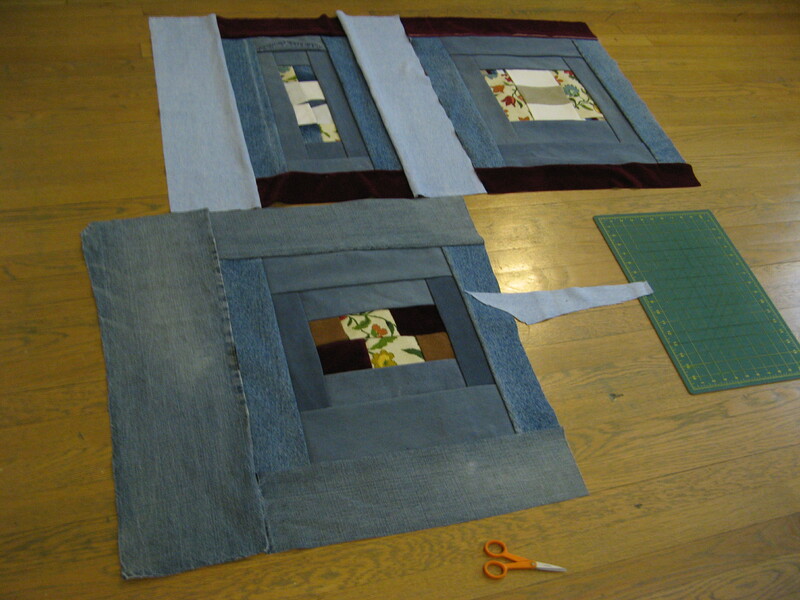 In the end these old pants yielded three quilts. Although I’ll admit, these three quiltops took a bit longer than a day to make. Next post will reveal the finished products, complete with khaki backs and yarn ties.